A 16-year-old boy named Tyler living in Prescott, Arizona received a very special delivery today of his very own Diabetic Alert Service Dog from Service Dogs by Warren Retrievers, also known as SDWR. Prescott, AZ, September 25, 2018 --(PR.com)-- Tyler, a 16-year-old boy in Prescott, Arizona, received a very special delivery today of his very own Diabetic Alert Service Dog from Service Dogs by Warren Retrievers. Based in Madison, Virginia, Service Dogs by Warren Retrievers, or “SDWR,” has a mission to provide specially-bred and custom trained dogs for people of all ages that struggle with living with invisible disabilities such as Autism, PTSD, Seizure Disorders, or in the case of Tyler - Diabetes. SDWR has hundreds of service dogs working around the globe and is currently serving approximately 1,000 families. Endy, a black labrador retriever Diabetic Alert Dog, has already received countless hours of training through SDWR’s service dog raiser program where volunteers raise puppies in training for approximately one year. The dogs and raisers must follow through the foundation and skill set training provided through SDWR trainers at the facility in Virginia. Endy is also an honored graduate of the SDWR Fallen Officer Puppy Program. The Fallen Officer Puppy Program, also known as “FOPP,” is an initiative by SDWR to pay respect to the legacy of service by fallen American police who sacrificed their lives in the line of duty. Endy is named in honor of fallen hero Police Officer Endy Nddiobong Ekpanya of Pearland Police Department in Texas who was killed when his patrol car was struck head-on by a drunk driver in 2016. Endy’s work as a Diabetic Alert Service Dog with Tyler will carry on in memoriam of Officer Endy’s life of service before self. Tyler was diagnosed with Type 1 Diabetes when he was 4 years old. He is insulin dependent and it is a daily struggle for him to keep his blood sugar at a normal level. Tyler’s family is hopeful that with the addition of a service dog it will help make their lives a little easier since they are constantly checking his blood sugar and monitoring his activity. A service dog will also be able to provide a sense of independence and security to Tyler. Tyler’s parents believe that a service dog will help him better manage his blood sugar and be his companion for life. SDWR uses a proprietary scent training method to teach Diabetic Alert Dogs to detect fluctuations in blood sugar that fall outside of a handler’s healthy range. Since Endy is a service dog and covered under laws in accordance with the Americans with Disabilities Act, he will be able to accompany Tyler and his family everywhere - from school, to grocery shopping, even to church. 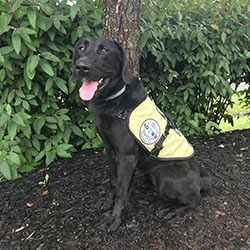 During the upcoming 18 months, SDWR will return to Tyler’s home every 3-4 months to continue working on Endy’s customized training, follow up training and training the human to make a successful team and public access certification. This certification can only be given to Tyler after a progression of hard work and dedication to the SDWR training program. This training program is what sets SDWR apart from other nonprofit service dog organizations. Service Dogs by Warren Retrievers is a nonprofit organization based in Madison, Virginia, and relies on donations to help the organization in its mission, “Until there’s a cure...there’s a dog.” To make a donation or learn more about SDWR, please visit the website, www.sdwr.org. To learn more about Diabetic Alert Service Dogs visit www.sdwr.org/service-dogs/diabetic-alert/. To learn more about SDWR’s Fallen Officer Puppy Program visit www.sdwr.org/fallen-officer-puppy-program/.